An unforgettable, 2-day experience hosted by Onnit in Austin, Texas. 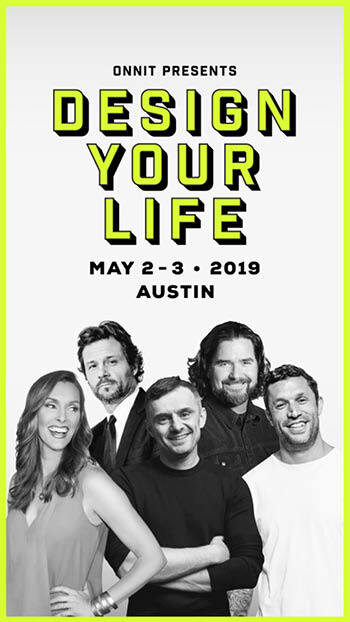 The event kicks off on Thursday evening at Austin’s historic Paramount Theatre, where attendees will have the chance to see award winning, best-selling, internationally recognized authors and serial entrepreneurs Gary Vaynerchuk and Aubrey Marcus. For the first time ever, these two influential voices will appear on the same stage. They will talk about health, wellness, entrepreneurship, and success. But most of all, they will tackle the question of how to design your life around the ROI of happiness, not money. Special guest opener IN-Q will kick off the evening with his unique style of spoken word. And if you're looking for more, purchase the Friday add-on at checkout, and join us in an immersive all-day experience at an East-Austin private venue. Enjoy keynote talks by Aubrey Marcus, David Rutherford, and Emily Fletcher, and a story telling workshop with IN-Q. Lunch, drinks, dinner all included. At the end of the day, you'll have the tools and inspiration to design your best life. Please note, tickets for the Friday add-on are limited, and only available with the purchase of a ticket to the Thursday show.